Young Jakub Hanauer's whole world turned upside down when the German soldiers came and took his father away. His father was a great musician and violin repairer who played in orchestras. His brother was a violin progidy who had a great future. Jakub felt he never could be as good as his father or his brother. Now the Germans are back and the remaining family, his mother and younger brother, are being loaded on trains to be transported away from their home. 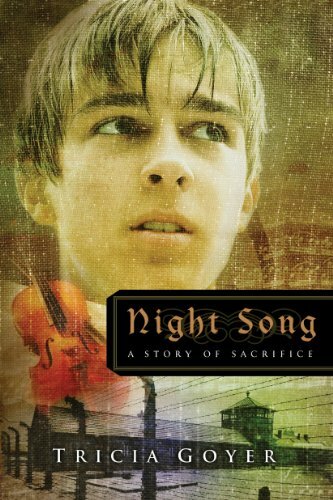 At the concentration camp of Mauthausen he is thought to be his talented brother and put into the care of a world renowned conductor and forced to play in the camp's orchestra. But can he fool everybody with his music or will his deception be found out? Evie and Nick are a young couple who met in the States. He is learning to be a doctor and she is the daughter of a diplomat from Europe. 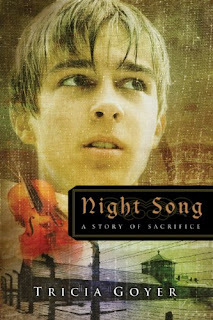 The night Nick was to propose changed their lives forever when Evie's family was ordered back to their homeland. With news of the war ever increasing, Nick receives his draft papers and is now training as a medic. He hopes he can find Evie in Europe and will take great risks to do so. But in an encounter with the resistance,Evie has had circumstances happen that drive her into hiding making the task Nick sets for himself impossible. As a young German soldier, Otto longs for the power that he had inadvertantly witnessed at a high ranking German officials private meeting. Not just the everyday human driven power but the spiritual power from another world that he knows can rule over everything else. Nothing will stop him from trying to attain that. But when he in his pride tries to make it happen he is transfered over to help catagorize the ever increasing stash of musical instruments. This was my first book by this author and it will not be my last. Inside the horrific details of the death camp, Tricia Goyer has told a beautiful tale of faith, grace, courage and survival. The way she tied the three threads of the story together was really well done and it was hard to put the book down even though some of the details were so hard to read. The historical details were so well researched and woven into the personal stories so well it was like a movie running through my head as I read. My heart was gripped and torn at Jakub, Evie and Nick's stories. I will say though that there was a large cast of characters because of the three story lines and at times I did have to pause and think who different characters were. But this is definitely one of those stories that gave me a "book hangover" where I had to process everything for days afterward. Though this is a stand alone novel there are some others in this World War II Liberators series that I will definitely be reading! Thank you to Tricia Goyer for sending me this beautiful story. I've only read one other of hers, coauthored with someone else, but it was good. This one sounds great! Going on to the TBR list! Sounds good. I just started a mini devotional by her on the Bible app!!!! It goes along a little bit with my small group study Breathe.